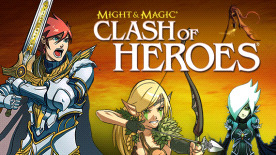 Set in the Might & Magic® universe, Might & Magic Clash of Heroes®, 2011 award winner and critically acclaimed Playstation®Network & Xbox LIVE® game, is coming for the first time on Windows® PC! This PC version will incorporate the same role-playing elements, adventure, and an innovative and dynamic combat system based on puzzle mechanics and new online features. Various challenges: Defeat the enemy heroes by crossing their armies in standard battles. Launch into special challenges and Boss fights where your strategic skills will be put to a severe test. Solve puzzle battles by finding the right combination and wipe- out the enemy in a limited number of turns. Vibrantly detailed settings: Explore highly detailed maps full of knights, elves, wizards, necromancers and demons and interact with a unique manga style inspired environment. Prequel to M&M Heroes: Play the childhood of the five main Heroes: Anwen, Godric, Fiona, Aidan and Nadia. Build your own army: Select the best combination of creatures and artifacts to give you the strongest advantage on the battleground. Join a friend and face up to two opponents in dynamic & strategic coop battles. © 2006 Ubisoft Entertainment. All Rights Reserved. Dark Messiah, Might and Magic, Ubisoft and the Ubisoft logo are trademarks of Ubisoft Entertainment in the U.S. and/or other countries. Developed by Arkane Studios.